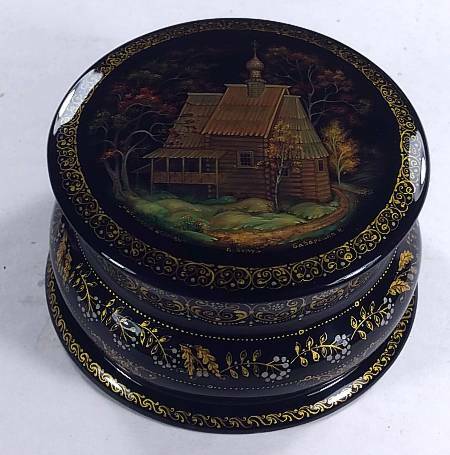 The Nikolskaya wooden church is shown at the top of this handsome box. The scene is quiet, no people around, and the darkish palette further enhances the peaceful ambiance. There is a good amount of detail in the ancient structure, as well as in the trees that surround it. The silver and gold ornament, which mixes elegant brush strokes with floral and berry images, adorns the side and is extremely well done for a box in this price range. The box has no hinge and sits flat on the table surface. 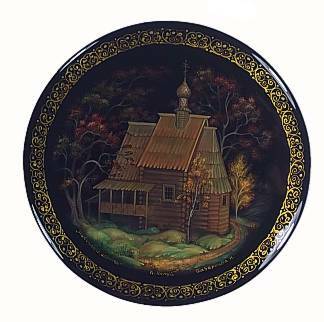 The name of the artist (N. Babarkina), the title and the village where it was made is written at the bottom of the drawing.